This meal usually loosens up our 60ish constitutions. 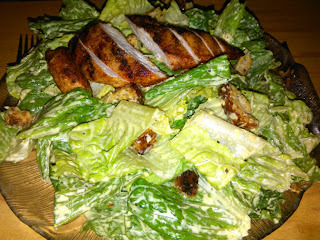 Lettuce is finally on sale for .98 a head instead of $3 so it's a joy to have a plate of crisp romaine again. I actually used a big pot instead of smaller bowl for mixing. Helped a bit, an even larger pot would have been easier. 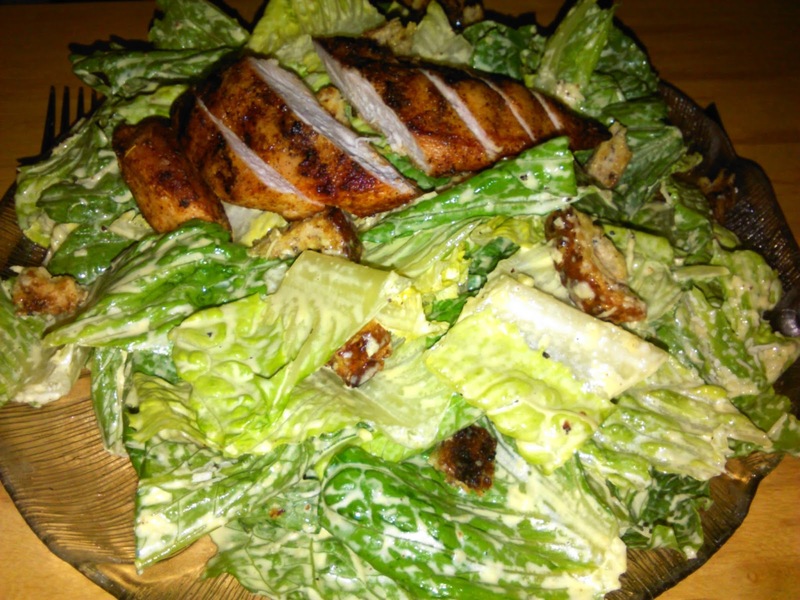 A Caesar Salad has 3 components, romaine lettuce, croutons and dressing. The croutons I usually make from Alpine Bread. Dry it, cut it up and fry croutons in olive oil with a bit of salt. Romaine lettuce cut up, washed and spun dry. Use the whole head. Separate the egg yolk and wash the whites down the sink unless you really want to make pralines. One teaspoon at a time whisk the oil into the egg yolk. Whisk in all the other ingredients except Parmesan and croutons. Toss the dried lettuce in the dressing till evenly coated. Add croutons and parmesan cheese and toss again. Serve. The Cajun Chicken was seasoned, salted and coated with olive oil then cooked on the BBQ for about 20 minutes. I always feel good after eating this meal.